Erard, Paris, 1840. Six and two thirds octaves, CC-a4 (originally to g). Inventor of the double-escapement repetition action, Erard was the direct competitor of Pleyel. Liszt's preference was for Erard's more dramatic range of tone colors, while Chopin played both makes, preferring the more intimate sound of the Pleyel except when he was feeling ill and wanted a piano that would produce more effects with less effort. This piano works well for both composers' music. 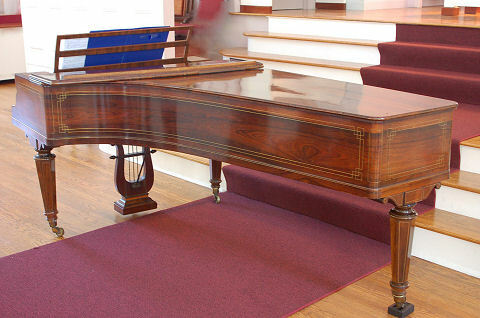 For further information on the Historical Piano Concert Series, The Historical Piano Study Center or any other item on this page please send e-mail to the . For complete contact information and how you can help support the Historical Piano Concert Series and/or The Historical Piano Study Center click here. Questions or comments about this web site should be sent to .